An English lathe, made from the late 1920s until the early 1950s, the Grayson was manufactured by E.Gray & Son of 18-20 Clerkenwell Road, London, E.C.1. - a company established in 1822. The firm marketed at least two sizes of lathe: a rather light and now rare 3-inch centre-height machine and the much more robust and common 3.5" x 18" model illustrated above. As usual with English machines of this type, there was a degree of cross-fertilisation between makers: the smaller of the two lathes being a re-badged Randa (also made in London) while the larger model (with all-V-belt drive and other small improvements) was adopted during the early 1950s by the Granville company as their Type CSL2 - and also badged as a Warwick for sale by the Victa Company and as the "London" for an unknown distributor. 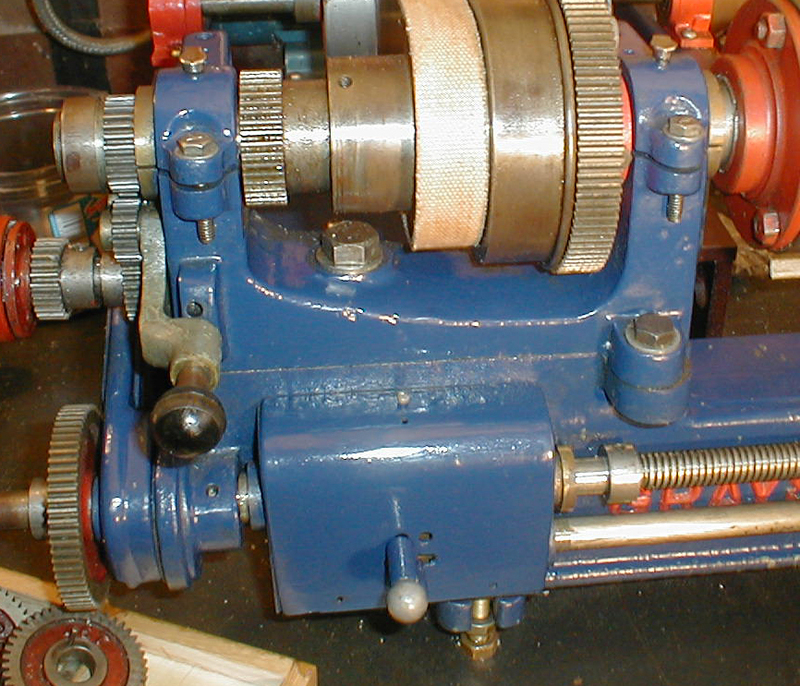 A heavy, well-made small lathe with backgear, screwcutting, a gap bed and tumble reverse as standard, the 3.5-inch Grayson admitted 20 inches between its centres which, unusually for a lathe of this size and vintage, were both No. 2 Morse taper. The bed (which weighed a little over 50 lbs) was of traditional English-style with flat-topped ways and 60º edges; it was, even for its period, of old-fashioned appearance with a stiffening rim around its unnecessarily-curvaceous lower edge. Although the headstock-end foot was generously long, and the bed could easily have been made of cantilever form like that on the contemporary Drummond M-Type, the makers still used a foot under its tailstock end so giving an owner an opportunity to distort things by bolting it to an uneven surface. In line with contemporary practice there were no guards to protect fingers from the dangerous attentions of the changewheels, backgear or headstock belt drive. Usefully long at 7-inches, the saddle together with the 6.5" x 3.5" cross slide and 5" x 25/8" top slide were all T-slotted, with the latter carrying an end bracket arranged to allow the slide to pass under it and so increase the travel to a useful 3.5-inches. Unfortunately and rather oddly (on other than very late machines), the rather short cross slide, with exactly the same travel, did not benefit from the same type of fitting but had to make do instead with a flat end plate that deprived the user of those two extra inches that would have been so useful when using a vertical milling slide. While early models lacked micrometer feed dials on the compound slide rest on later models (probably after World War Two and in line with rival machines), they were fitted as standard. The carriage handwheel (mounted on a simple, single-thickness apron) drove the bed-mounted rack through a reduction gear, so affording a rather more sensible and sensitive feed rate than afforded by the crude direct-drive used on the competing Myford ML4 and other contemporary small makes; unfortunately, not all model years were fitted with this refinement, some examples have also been discovered with a "direct-gear" drive. Following contemporary light-lathe practice, the headstock had split phosphor-bronze bearings closed down by clamp bolts at the front. The backgear reduction ration was the usual small-lathe 6 : 1 and the bull wheel connected to the belt pulley by a spring-loaded pin, making engagement and disengagement quick and easy. However, the backgears slid into engagement - a system which, while cheap and easy to manufacture, denied the owner the chance to make the gear mesh adjustments which an eccentric mount would have provided. The 1.125-inch diameter spindle was bored to pass a 5/8-inch bar and the threaded nose, at 1.125" x 12 t.p.i., was identical to that used on the Series 7 Myford but without the latter's raised location spigot behind the thread. Until the arrival of V-belt drive in the late 1940s the spindle was driven by an inch-wide flat belt running over pulleys 4.25", 3.25" and 2.25" in diameter. Retained by simple split pins, the changewheels ran on plain studs carried on a substantial and well-located banjo arm equipped with two parallel slots. 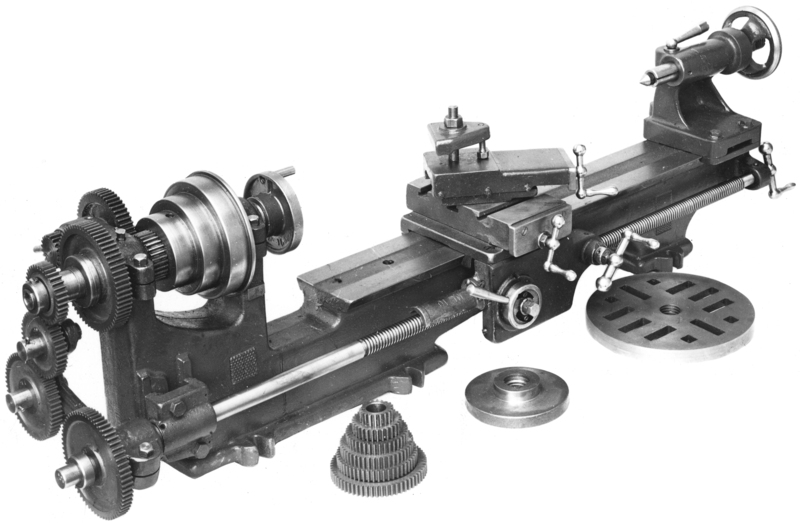 Unusually for a cheaper lathe, tumble reverse was fitted from the start of production; at first the mechanism was locked into its setting by a bolt but later models were modified, with a much-quicker-to-operate and convenient spring-plunger arrangement with the operating arm in either cast iron or bronze. 5/8-inch diameter, the 8 t.p.i leadscrew was gripped by double clasp nuts and fitted with a simple ungraduated handwheel at the tailstock end that was fitted, like all other screw feeds on the lathe, with proper "ball handles". 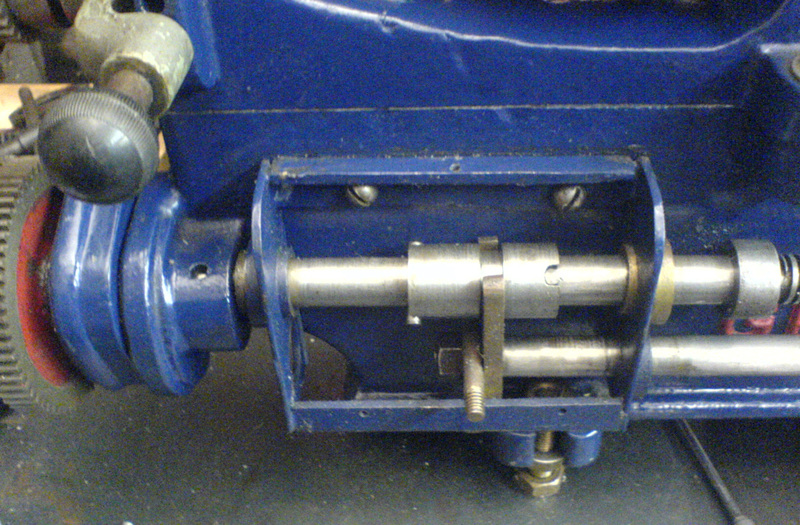 Able to be set-over, the tailstock (with a locating pin to reset to centre) was guided on vertical shears between the front and rear bed ways and had a hollow, "pass-though" 1-inch diameter barrel with a usefully long-travel and a square thread--but with a drive wheel that was far too small and lacked a handle; the only concession to help the operator get a grip with oily fingers being a line of shallow knurling on the outer edge of its rim. 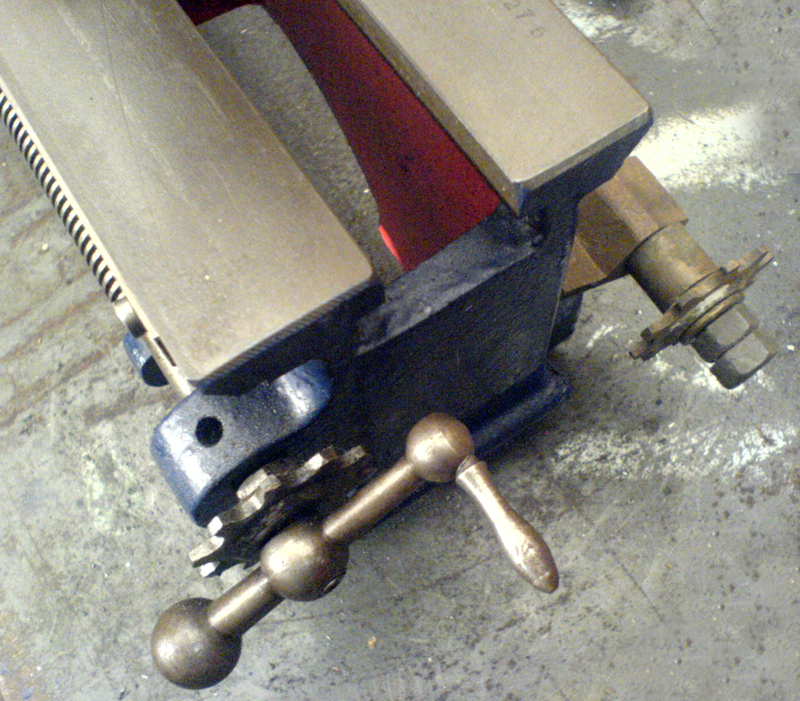 The barrel was clamped by arranging for a stud-mounted lever to close down a long slit in the side of the tailstock casting; a satisfactory arrangement when the machine was new, but increasingly useless and likely to snap the casting as it became worn. 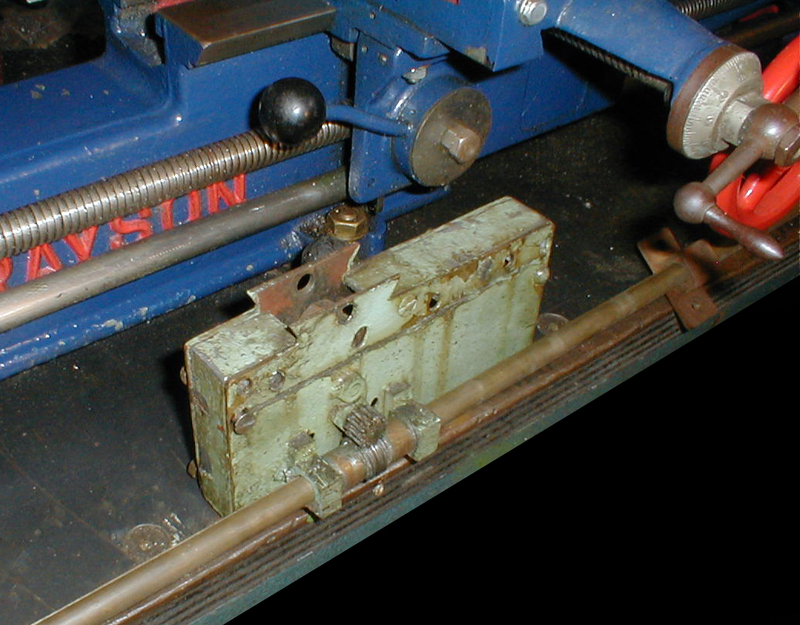 Some machines, which must have been the last made, were given a proper "spilt-bar" clamp that secured the barrel without stressing the casting. Over the years four drive systems were available: a wall or ceiling-mounted countershaft, a foot motor with a 50 lb flywheel (which could be installed under the owner's own bench), a stand with a self-contained treadle-driven flywheel assembly or, on late machines only, a neat integral countershaft bolted to the back of the bed. Supplied as standard with every Grayson was a 7-inch faceplate, catchplate, 10 changewheels to cut English threads, a screwcutting chart and two No. 2 Morse centres. In basic form and without a chuck or countershaft the lathe weighed 112 lbs. The cost, in the mid 1930s, was £12 : 12s : 0d. or about four times the average weekly wage of a skilled craftsman. A later version of the 3.5-inch Grayson featured power cross feed driven by a shaft which lay along the front of the bed. A smaller Grayson lathe, the 3-inch, is also described below..
A Grayson lathe as badged during the early 1950s for the Corbett Company of Sutton-in-Ashfield, Nottinghamshire, as a "Granville" Model CSL2. This version was fitted with all-V-belt drive and other minor refinements. A Grayson badged as a "London"
Grayson from a 1930s catalogue. The model illustrated has a direct drive from carriage handwheel to the bed-mounted rack. The top slide carried an end bracket arranged to allow the slide to pass over it and so increase its travel to a useful 3.5-inches. 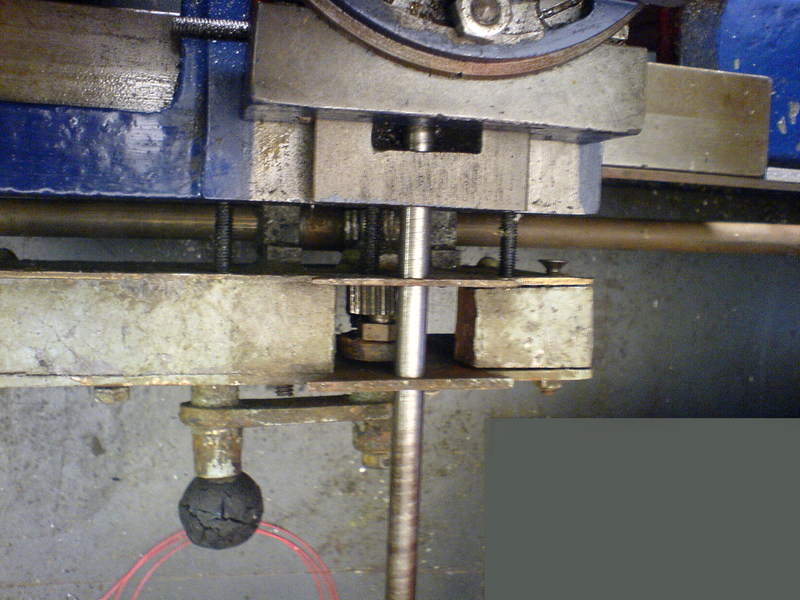 Unfortunately the rather short cross slide, with exactly the same travel, did not benefit (other than on very late machines) from the same type of fitting but had to make do instead with a flat end plate that deprived the user of those two extra inches that would have been so useful when employing a vertical milling slide. Tumble reverse was fitted from the start of production; at first the mechanism (as above) was locked into its setting by a bolt but later models were fitted with a much-quicker-to-operate spring-plunger arrangement with the operating arm being cast in either iron or bronze. Note the twin parallel slots in the changewheel banjo. A works publicity photograph of the Randa Type B as sold by Grayson and also, in the early 1930s, by Myford badged as the B.S.W. 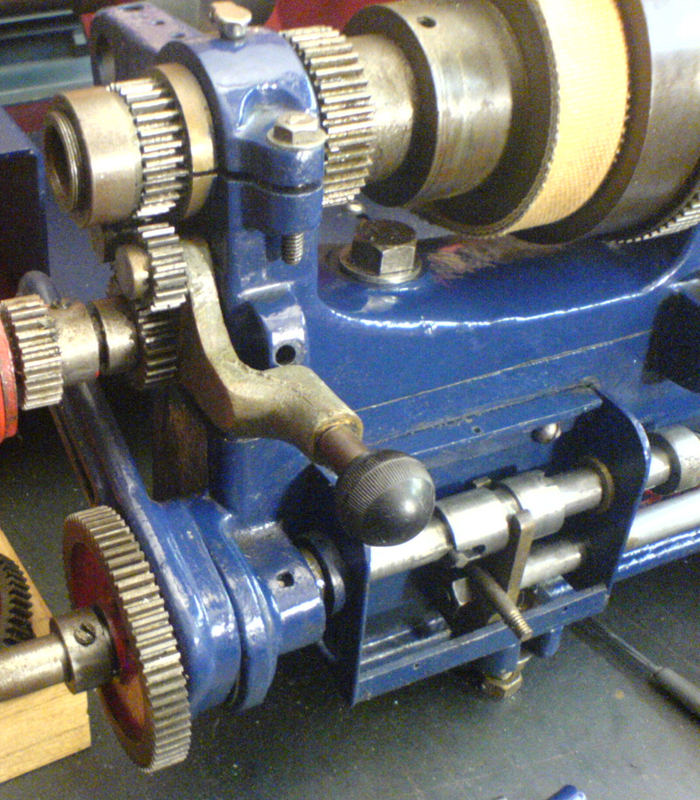 This version of the lathe has double clasp nuts to the leadscrew opened and closed by a lever-operated snail cam. Constructed as cheaply as possible, and making an interesting comparison with its larger, far better-engineered brother, the smaller of the two Grayson lathes was just a re-badged Randa lathe. It was available in both short and long-bed versions which offered 12.5 and 20 inches between centres respectively; the shorter lathe had a "cantilever" bed, with the four fastening bolts at the headstock end, whilst the long-bed model had an additional foot cast under its tailstock end. Clustered at the left-hand end of the headstock, the 6.25 : 1 ratio backgear assembly had its bullwheel fitted outboard of the bearing and was mounted on a tight-fitting eccentric-engagement bush; amusingly, the makers described what to do about the fit of this bush when it became loose: "After excessive use, any undue freeness in this part can be rectified by removing the shaft and bush , and springing open the bush, say with a screwdriver, the bush being saw-slotted at one end to allow this." Resembling that fitted to the Drummond Type B of some thirty years, the arm carrying the changewheels was L-shaped - and so designed to frustrate every owner's attempt to make sense of mounting a train of gears - especially a compound set - to cut a particular thread; 10 changewheels of 20, 30, 35, 38, 40, 45, 50, 55, 60 and 65 teeth were provided to drive the 5/8" x 8 t.p.i. leadscrew - a sufficient number to cut all the inch-pitch threads the amateur would be likely to need. Driven by a 3/4-inch wide, 3-step flat belt pulley with diameters of 2.25, 3 and 3.75 inches, the 3/8" bore headstock spindle carried a nose thread of 1-inch x 12 t.p.i. thread and a No. 1 Morse taper. Constructed in as simple a manner as possible, the single-sided apron had an adjustable-tension, spring-loaded "snap-in" clasp-nut assembly and a carriage-traverse handwheel gear - which was fitted with an engraved, adjustable collar to act as a thread-engagement indicator - driving directly onto the leadscrew instead of a bed-mounted rack - an identical system was used for many years on the much later Myford ML10. 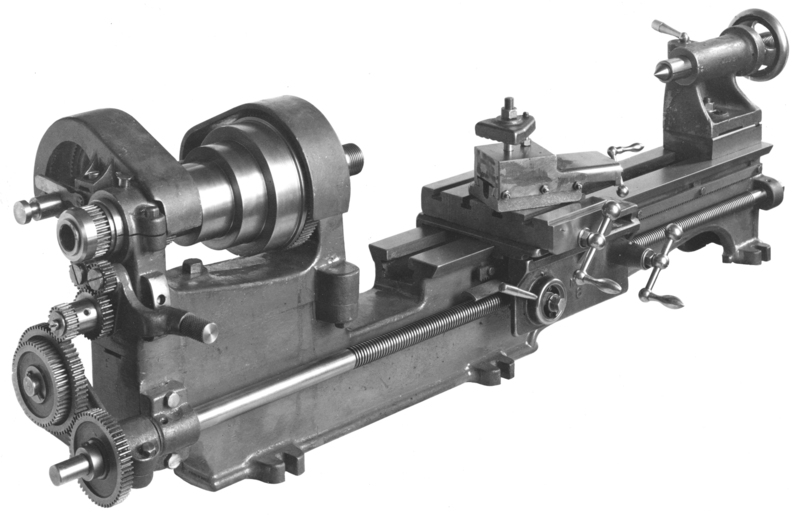 Instead of a single, swivelling tool slide, which one might have expected on a lathe costing as little as £6 : 7 : 6 in the 1930s, a proper compound-slide rest was fitted with each axis having 3 inches of travel; the squared-thread feed screws were not fitted with micrometer dials but the ball handles were threaded, and fitted with locknuts, so that end play, as it developed, could be adjusted out. Of a similar design, but on a smaller scale to that of the larger lathe, the set-over No. 1 Morse taper tailstock was guided not on its own ways down the centre of the bed, but on the same outer Vs which located the carriage.. The stand, at £5 : 5s : 0d, had cast iron legs and a pressed-steel drip tray with "welded corners" and a counterbalanced flywheel. 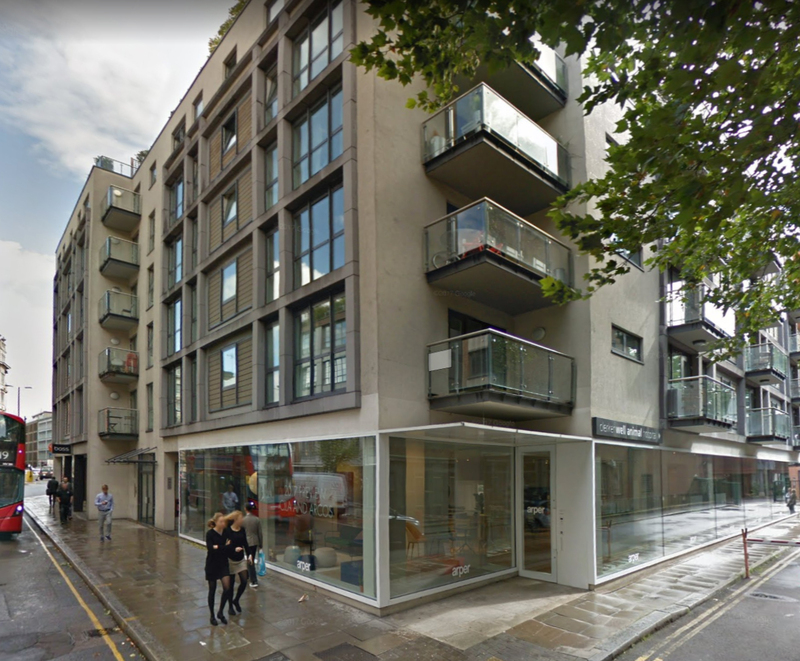 No longer the site of a small factory, the former corner-site home of Gray & Son at 18 Clerkenwell Road, London, is now an anonymous block of shops and apartments. However, the area, once heavily involved in watch and clock making is still associated with the trade.